A week ago we mentioned how the likes of Bryan Thrift and Andy Morgan were on 12-month hot streaks that were unmatched. Well, Jacob Wheeler didn’t just match theirs; he surpassed them! By winning the BASS Elite Series opener on Cherokee Lake, the 26-year-old jumped his 12-month average to 890.061. Meaning, in the last 12 months (during which he’s fished 12 events between the Major and Minor levels), he’s averaged beating 89 percent of the field in every tournament. In other words, if all of the tournaments were 100-angler fields, he’d average finishing 11th in all of them. In his current streak, Wheeler has seven top 15s and 10 top 25s. He hasn’t finished outside the top 50 in a tournament since August of 2015. So how is Wheeler only ranked seventh in our Majors Ranking? An up-and-down 2015 has a few tournaments he needs to drop, starting with one that will fall off at the end of next month. If he continues fishing as he is and those tournaments start to drop off, Wheeler could soon find himself as the youngest angler to be ranked No. 1 since our site launched. 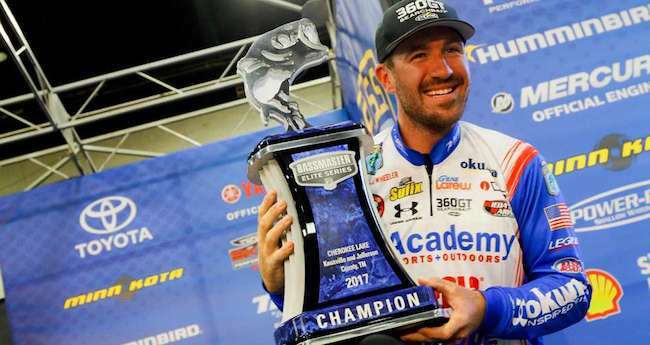 While Wheeler deservedly grabbed the headlines over the weekend, the top-ranked angler on the Elite Series, Keith Combs, kept doing what he always does. He quietly was the bubble boy, finishing 13th. That was three spots ahead of the angler nipping at his heels in the ranking, Jordan Lee, who is fourth in our ranking after his 16th-place finish at Cherokee. In fact, there are eight Elite Series anglers in our top 10, and all of them finished in the top 35 (Aaron Martens was the lowest finisher at 33rd). Obviously, one bad tournament can cripple an average (look at former No. 1s John Cox and Scott Martin, who are now 12th and 13th, respectively, after Guntersville), but these anglers are all fishing at the top of their games right now.